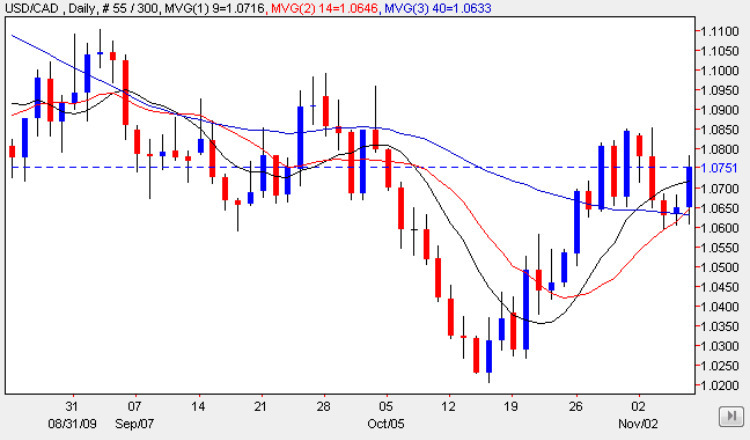 The usd to cad pair made a brave attempt to rally higher following the sharp sell off in the pair on Tuesday, and ended the currency trading week with a wide spread up candle, which breached both the 9 day and 14 day moving averages, with the open of the session finding good support from the latter of the these two averages. Despite this positive move higher, the daily chart for the usd to cad still remains bearish, with the deep congestion area ahead yet to be breached and indeed which was a contributing factor to the failed attempt to rise in the previous week, with the pair only managing to partly penetrate this dense area of price action. However, with Friday’s break and hold above all three moving averages, this is a positive signal for the short term, but only a break above this solid area of congestion will be sufficient to signal that the recent bear trend has now run out of steam, which is certainly not the case at present. Only a break above the 1.115 price handle will be sufficient to signal a possible return to an upwards path for the usd to cad pair. With no items of fundamental news on the economic calendar for the US and only Canadian Housing Starts which are expected to come in 157k – up from the previous – today’s price action will be technically driven and volatile! You can keep up to date with all the latest fundamental news on the economic calendar, latest currency news and live currency charts by simply following the links. I have also included details on an excellent ECN broker.